Plus, I just couldn’t resist the “sale” at Whole Foods for moderately affordable strawberries (oh, boy, only $2.99 a berry!). This was clearly written in the stars, so I plunked down with Alice Waters and cobbled together a couple of recipes to find a combo of fat and flour that went well with balsamic-drenched berry goodness. Survey says? Nailed it. 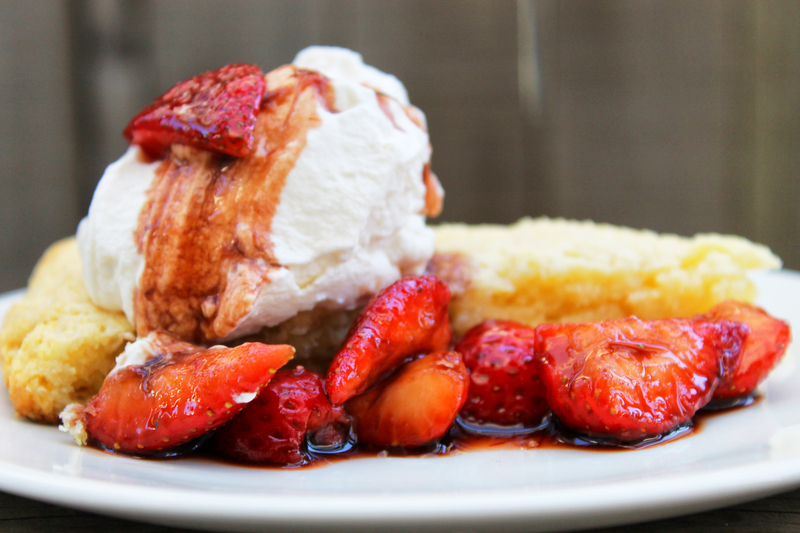 Don’t skip the balsamic, even if you haven’t tried it before and it seems weird to you. It’s a winner, trust me. 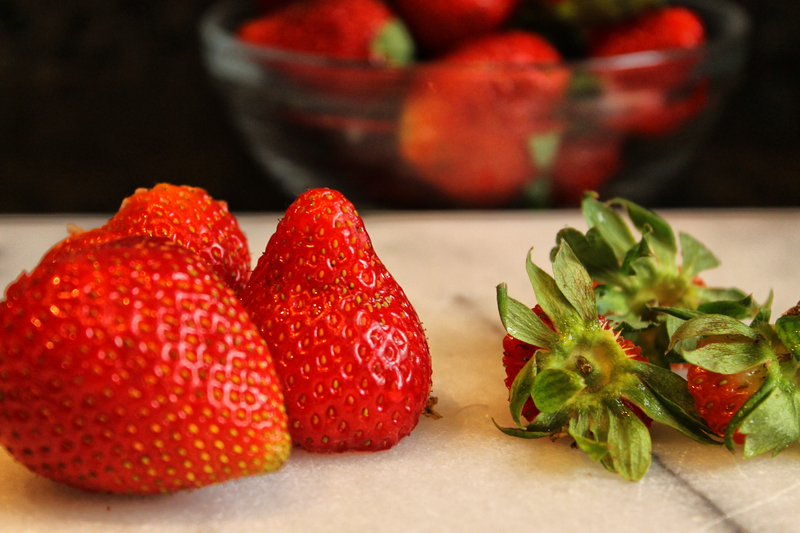 In a bowl, combine the chopped strawberries, vinegar, and brown sugar. Stir to coat the strawberries and let sit, stirring occasionally. Preheat your oven to 400 degrees and line a baking sheet with parchment paper. In a large bowl, combine the flour, sugar, baking powder, and salt, and stir to combine. Sprinkle in the butter and, using a fork or pastry blender, cut the butter into the mixture until a fine crumb forms and no large chunks of butter remain. 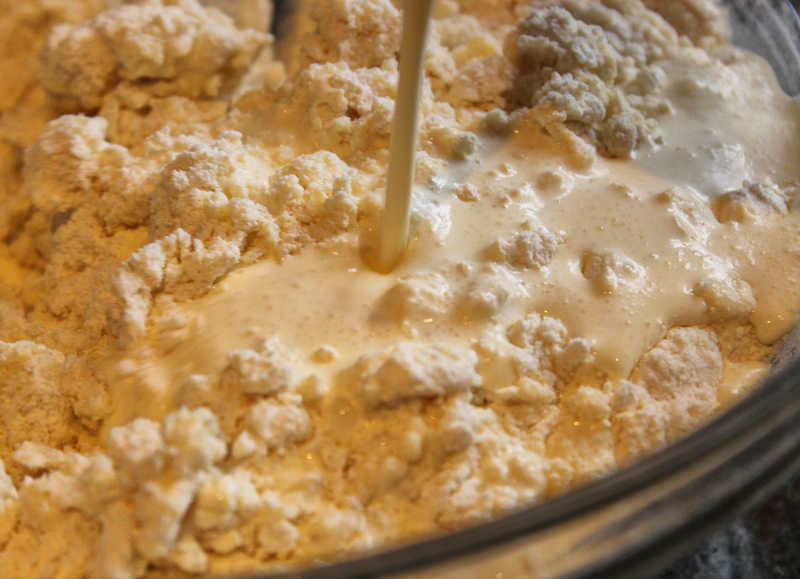 Slowly pour in the 1.5c cream and mix just until combined. Knead for 4-5 turns and turn out onto the cookie sheet. Use your hands to form a large, flat circle, about 10-12″ across and 1″ high. It’s easier if you use one hand to shape the edge and the other to flatten, turning it in a circle as you go around. Cut the disc into 12 wedges, but leave them in the circle. Sprinkle with the 1 T sugar. Bake for 20-23 minutes, or until cooked through. It doesn’t have to be brown– they will be ready when they are quite pale. Just test the center with a knife and make sure it’s not doughy. Remove from the oven and let cool. Whip the 1c cream until stiff, adding the powdered sugar and vanilla about halfway through, before it’s fully whipped. 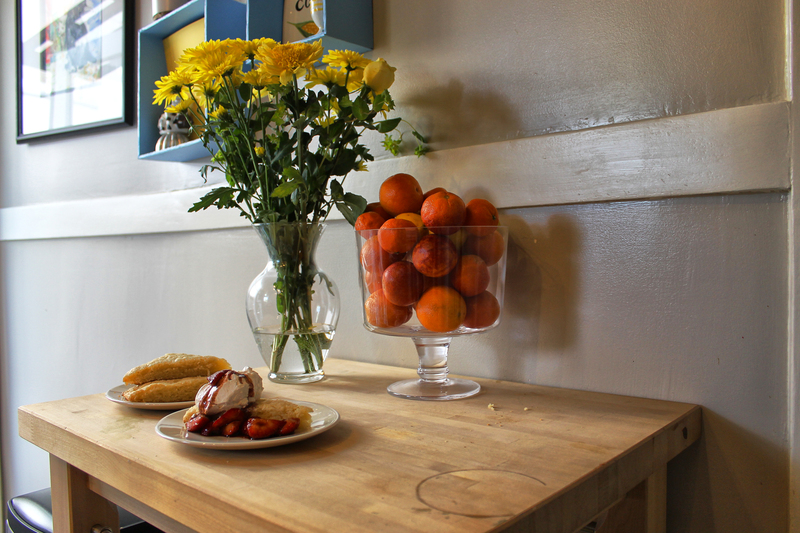 Plate the shortcake with one wedge, a spoonful of berries, and a spoonful of cream. Enjoy! 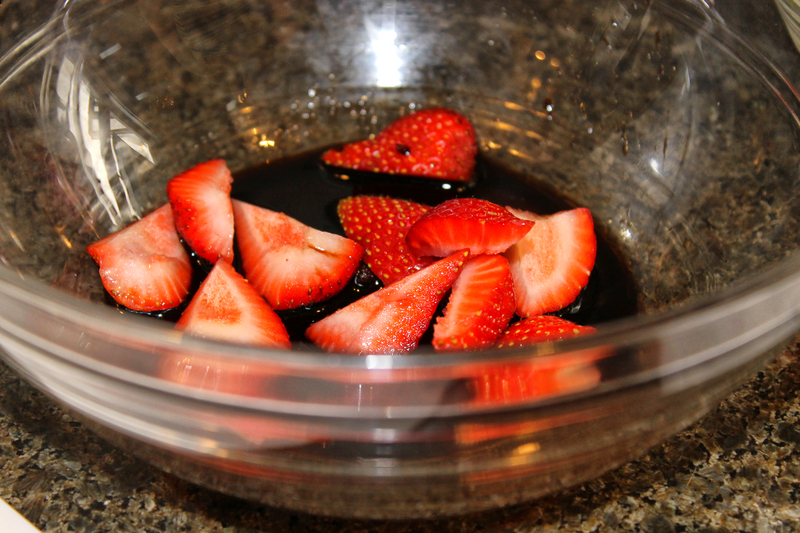 In a bowl, combine the chopped strawberries, vinegar, and brown sugar. Stir to coat the strawberries and let sit, stirring occasionally. In a large bowl, combine the flour, sugar, baking powder, and salt, and stir to combine. Sprinkle in the butter and, using a fork or pastry blender, cut the butter into the mixture until a fine crumb forms and no large chunks of butter remain. Slowly pour in the 1.5c cream and mix just until combined. Knead for 4-5 turns and turn out onto the cookie sheet. Use your hands to form a large, flat circle, about 10-12" across and 1" high. 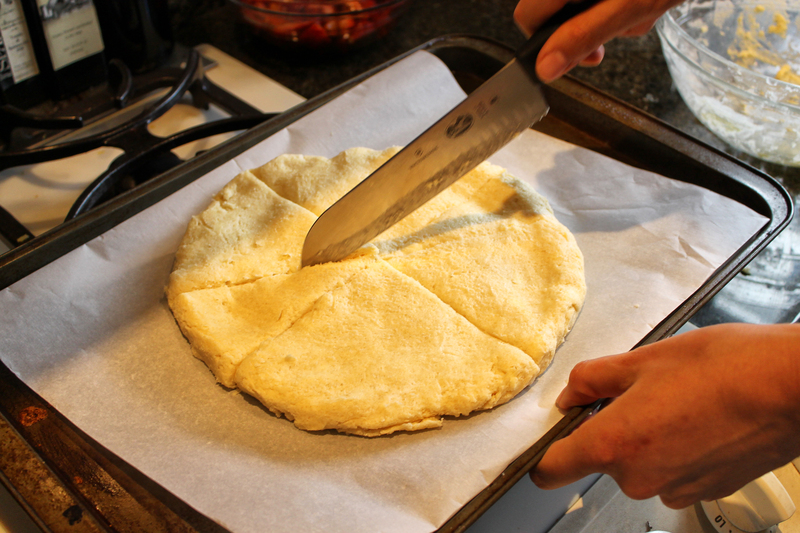 It's easier if you use one hand to shape the edge and the other to flatten, turning it in a circle as you go around. Cut the disc into 12 wedges, but leave them in the circle. Sprinkle with the 1 T sugar. Bake for 20-23 minutes, or until cooked through. It doesn't have to be brown-- they will be ready when they are quite pale. Just test the center with a knife and make sure it's not doughy. Remove from the oven and let cool. Whip the 1c cream until stiff, adding the powdered sugar and vanilla about halfway through, before it's fully whipped. 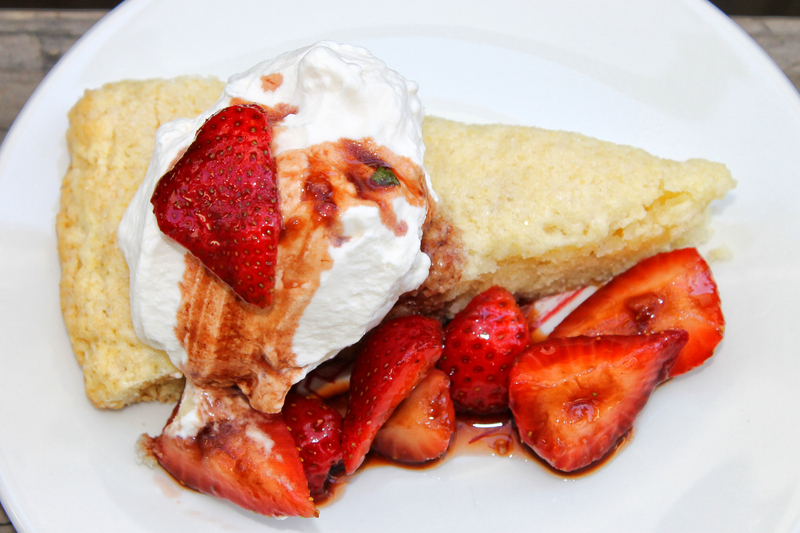 Plate the shortcake with one wedge, a spoonful of berries, and a spoonful of cream. Enjoy! Shai! I only JUST saw this comment. You are so sweet! How is life in Israel?? Your blog photos have been blowing me away– you have a gift!